I found the tone of this poem interesting, and it was a war poem which was new to me. It highlights in a very simple, ordinary way, the inequalities between men and women at that time. Earlier that day I had heard the BBC war correspondent Kate Adie talk about how the First World War had, through necessity brought on by a shortage of men at home, broken down pre-conceptions of what work women could do. She said that before the war, women were not allowed to work delivering mail because it was thought that they might forget the addresses, but during the war, women took on traditional male roles such as postal work. Of course, I was also struck by the mention of knitting, and the reluctant sock knitter in the poem. Her resentment at being left behind to knit and the strong sense that she knits only out of duty feel completely at odds with my own knitting for pleasure. 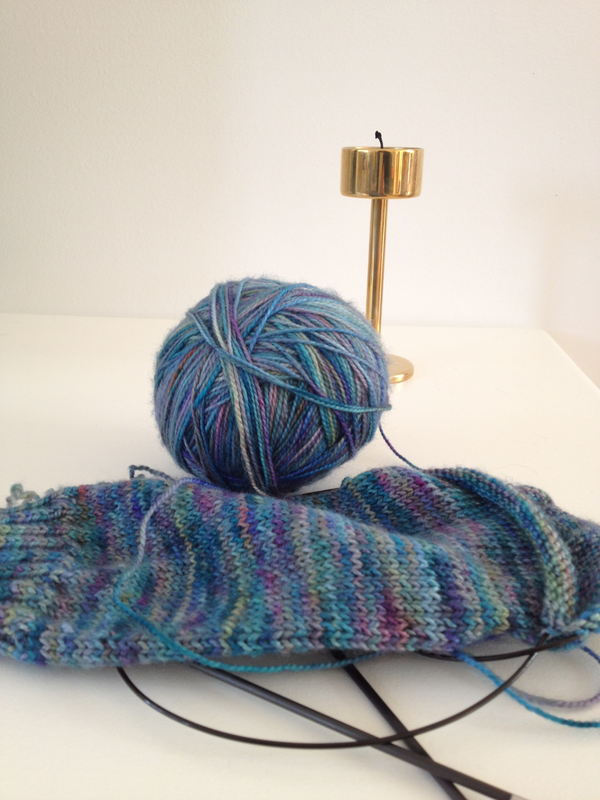 I happened also to be knitting a sock last night, but I did so because I want to, rather than because I feel it is the only way I can be useful. My sock is a colourful source of pleasure, rather than a tether to a restricted life I resent.